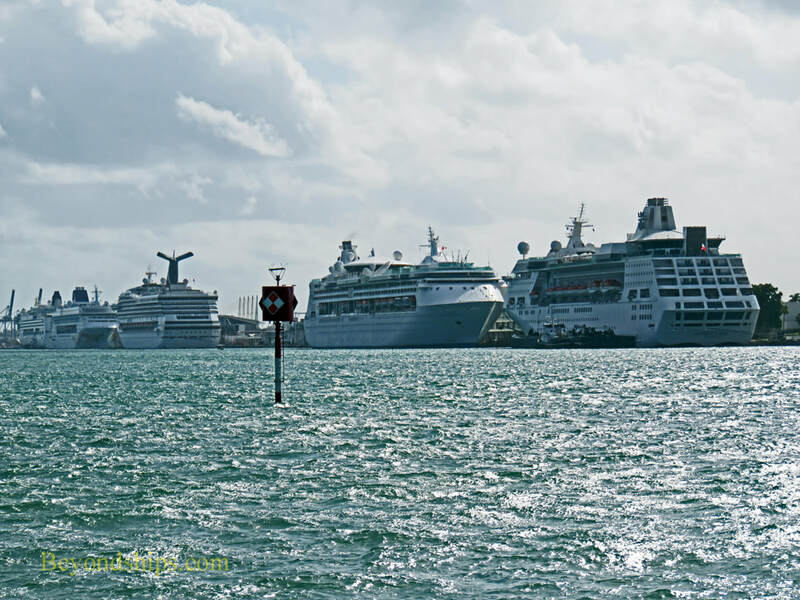 Miami rejoices in the title “Cruise Capital of the World.” It now handles over 5.3 million cruise passengers a year. 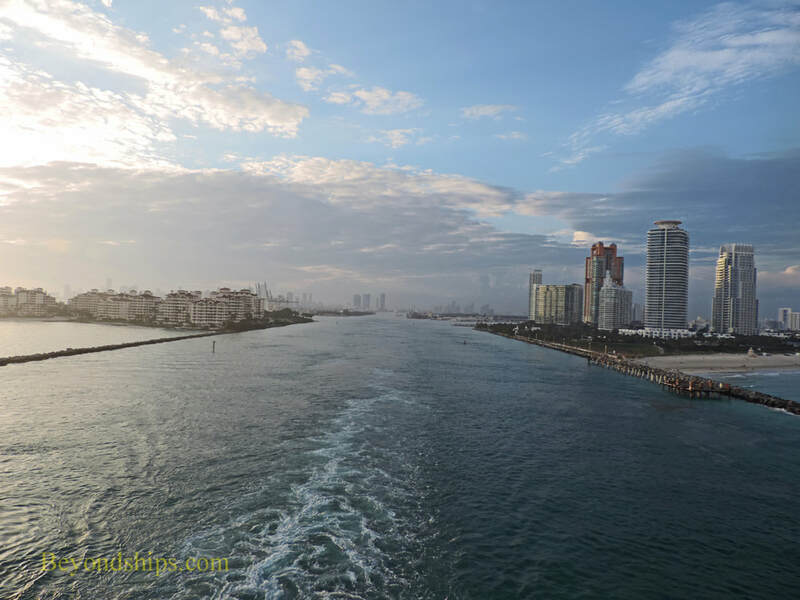 Miami is primarily an embarkation (a.k.a turnaround) port where cruises begin and/or end. Occasionaly, it is used as a port of call by ships based in other ports. The cruise port is located on Dodge Island, which is a man-made island created out of three natural islands: Sam's, Lummus and Dodge islands. The cruise port covers some 518 acres. There are also cargo container facilities on Dodge Island. Dodge Island lies in Biscayne Bay, a bay that lies between a series of barrier islands and the Florida mainland. It is connected to the mainland by the Port Boulevard Bridge. The Port Tunnel connects Dodge Island to the MacArthur Causeway. Cruise ships going to and from Dodge Island go through Government Cut. Created in 1903, Government Cut is a manmade harbor entrance, which divides Miami Beach on one side and Fisher Island on the other. Most of the cruise terminals lie in a row along the north side of Dodge Island. A cruise ship going to one of them from the sea sails through Government Cut, westward along a narrow channel, which is bounded by the MacArthur Causeway to the north and Dodge Island to the south. Cruise ships parallel park beside the terminals. The channel is not wide enough for a modern cruise ship to turn around. However, at the end of the channel is the Main Turning Basin, where cruise ships can execute a 180 degree turn. Some captains take their ships to the turning basin when they arrive in port (i.e. before docking). Others wait until they are leaving, push off from the dock and then bring the ship down to the turning basin to turn around. They then go back up the channel past the cruise terminals, through Government Cut and out to sea. The port has eight cruise terminals. Seven of these are on the north side of the island (cruise terminals A, B, C, D, E, F and G), Terminal H, which is used by Resorts World Bimini, is on the west side of the island. Terminal J, which caters to small luxury ships is on the south side near the Royal Caribbean headquarters building. 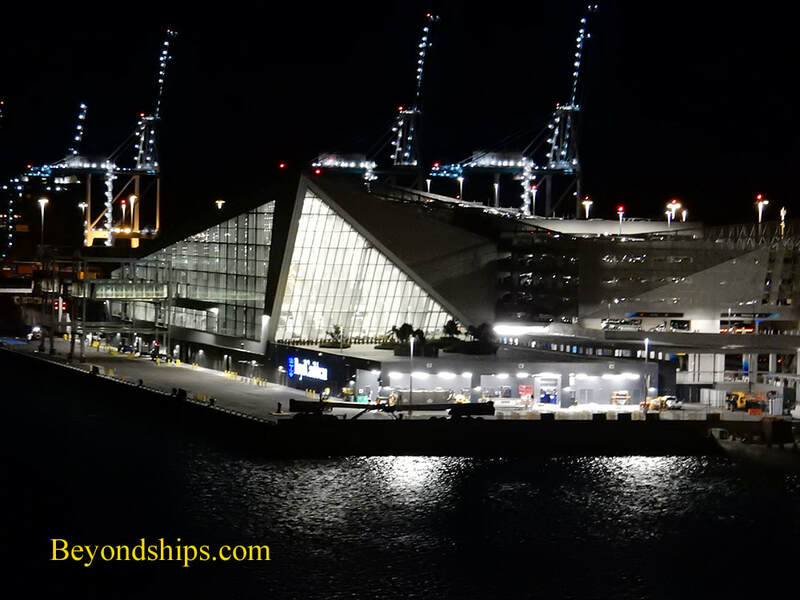 Cruise Terminal A was constructed to accommodate Royal Caribbean's Oasis class ships, the largest cruise ships in the world. Terminal A is equipped with the latest technology to ease the embarkation and disembarkation processes. Construction has started on a new Cruise Terminal B, which will be constructed where the former terminals B and C stood. The ships of Norwegian Cruise Line and its affiliates will have berthing priority there. There is parking by the cruise terminals. Taxis, Lyft ad Uber operate at the port. 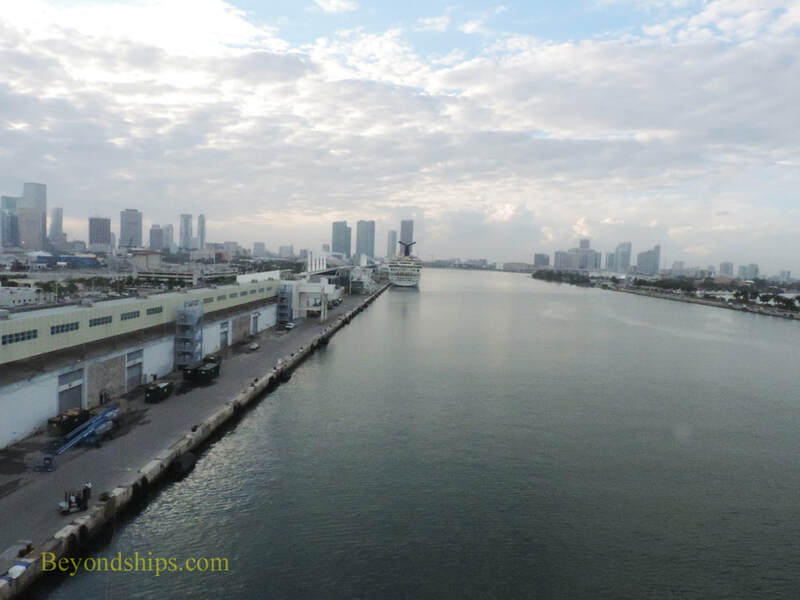 The cruise port is close to downtown Miami across the Port Boulevard Bridge. A complimentary trolley runs to the mainland and lops around to many sites of interest to tourists. Thus, cruisers with some time to spare can get to the Bayside Shopping Plaza for last-minute shopping or take in the Perez Art Museum. The free Metromover elevated people mover also runs around downtown. 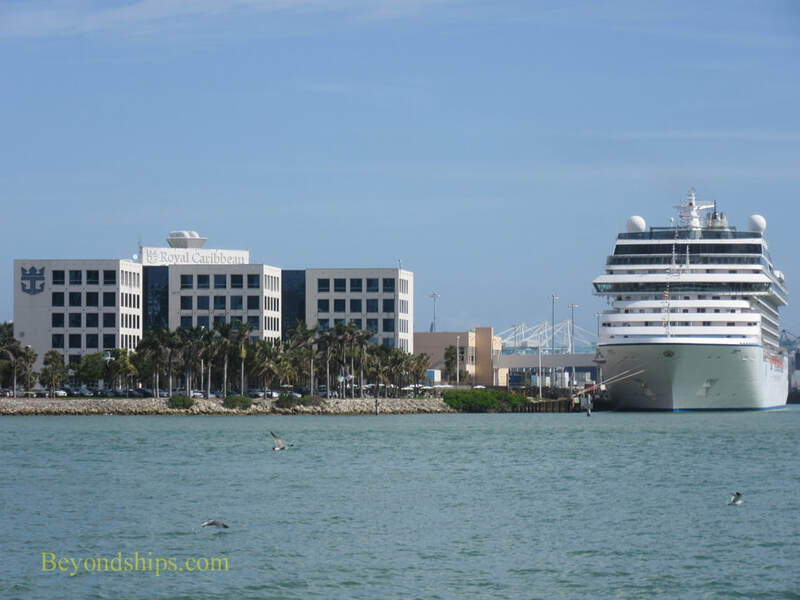 There are hotels in downtown Miami close to the cruise port. These include a number of 5-star international hotels but there are also a few hotels for those on a tighter budget. There are also hotels near the airport and in the surrounding communities including Fort Lauderdale. 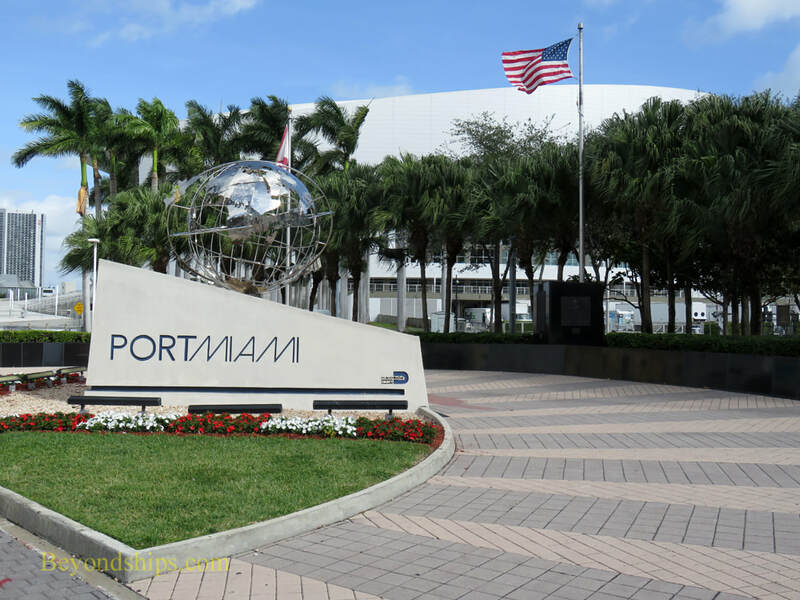 The cruise port is eight miles from Miami International Airport. Fort Lauderdale/Hollywood Airport is approximately 30 miles away. There is also an Amtrak station in Miami. Brightline provides a rail connection from downtown to Fort Lauderdale and West Palm Beach. Above: The main entrance/exit to the harbor is through Government Cut. ​Below: The Main Channel proceeds in a straight line to the cruise port on Dodge Island. Above: Most of the cruise terminals are in a row along the north side of Dodge Island. Below: Oceania's Riviera at Cruise Terminal J on the south side of Dodge Island. The nearby building is Royal Caribbean's headquarters. Above: Cruise Terminal A, "The Crown of Miami." (See separate review). 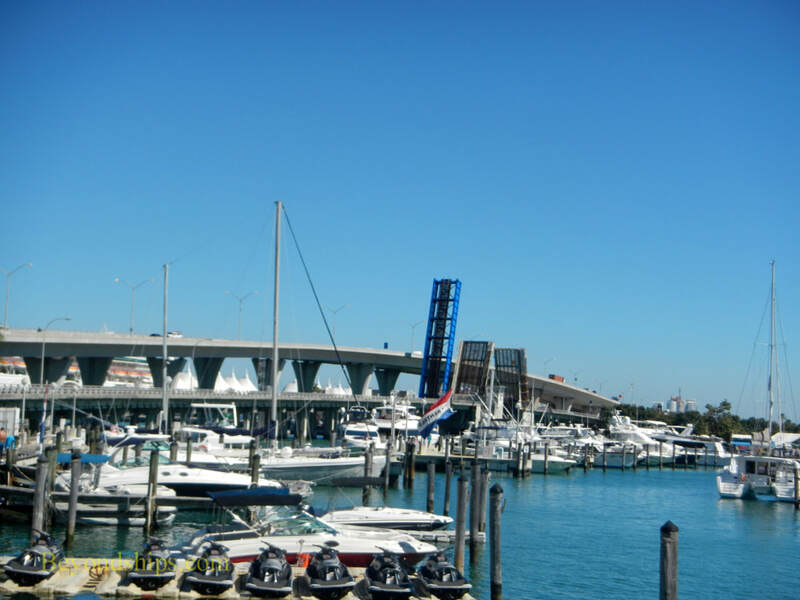 ​Below: The Port Boulevard Bridge connects the cruise port to downtown Miami.